Comments: This colorful poster of a farmer reaching into his pocket to give more for the war effort is a classic WW1 bond poster image. This one is in wonderful shape with the colors as clear and vibrant as the day it was made. 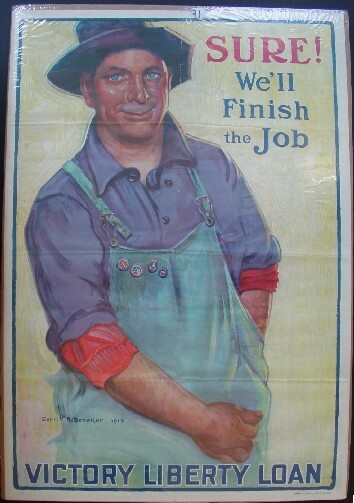 The warm smile on the farmer, the liberty loan pins on his overalls showing past contributions, and the combination of colors all make this a great poster. Condition: Excellent, shrink wrapped (the reason for the glare in the photo, colors are much better than shown) usual folds.